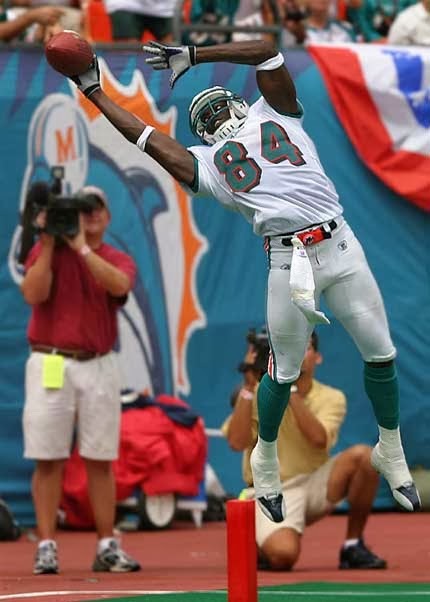 Brendan Taylor: What is your greatest memory in a Dolphins Uniform? 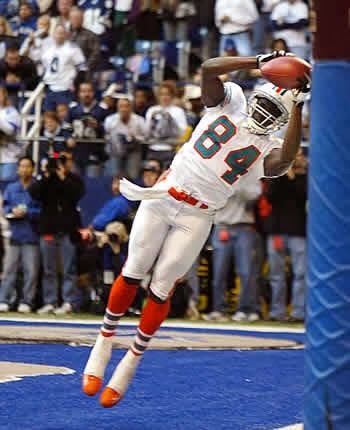 Chris Chambers: One of my favorite memories in Miami is breaking the Miami Dolphins Receiving and touchdown catching record in 2005 in a game versus the Buffalo Bills. I made a game winning catch with no time left on clock that led to a huge comeback. My ex badger and ex high school teammate Lee Evans also had 3 touchdowns for the Bills in same game. BT: You were a guy who was overlooked as far as draft position goes. Could you talk about what it felt like to get drafted at the time? CC:Going into draft I was 20th on Mel Kipper big board and to be drafted 52nd overall and the 11th wide reciever chosen in my draft class put an instant chip on my shoulder after being passed up by several teams that I thought would Draft me in first round. After finally realizing I will be playing pro football in beautiful South Florida I wouldn't change it for the world and was excited to start my career in pro football. BT: People don't understand what it takes to make it in the NFL, could just speak on the work ethic and what it takes to play at a pro bowl level like you did in 2005? BT: Being a pro-bowler in 2005 leads me to my next question which is during that year you were one of the best wide outs in the NFL with only Steve Smith and Marvin Harrison in front of you in touchdown catches. During your prime where do you see yourself ranking among the elite NFL wide receivers? CC:During my Prime I would say that I'm a top 10 wide receiver in the 2000's. I came in from Wisconsin as a pure athlete and over the years improved my route running which allowed me to play at a high level. In 2007 I felt the most complete as a wide reciever and in 2008 I was on my way to a great season leading the league in receiving Touchdowns the first 5 games with 5 touchdown receptions before injuring my ankle vs. the Dolphins.I would later go on to miss 3 or 4 games that season which put a dent on what was going to be a great season. I should have made 2 or 3 pro bowls during that span of my career and topped the one thousand yard Mark a few times as well. BT:The quarterback situation wasn't the most stable when you were here in Miami, how do you think your career would have played out had that position been more stable? CC: I think I have the record for most Touchdowns by a different quarterback haha. It was very difficult at times but I found ways to make plays no matter what the situation. I honestly believe if I had played with a more stable quarterback I could have put up close to 10,000 yards and 75 Touchdowns for my career. BT: An interesting fact about you is that you are 1 of 3 players in Miami Dolphins franchise history to lead the team in receiving yards for 4 consecutive seasons along with Nat Moore and Paul Warfield. In an organization that has had its fair share of pro bowl receivers where do you think you rank? CC: Oh boy that's Tough... I would say top 3 under the circumstances. 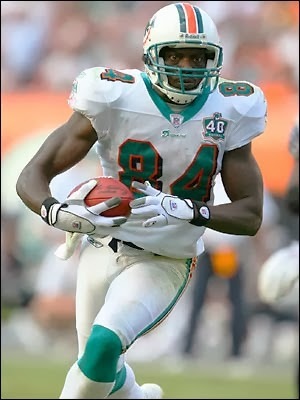 I didn't see much of Mark Duper/Clayton I just know they put up great numbers in a Dolphins uniform. Rounding out the top. 5 would be Nat Moore and OJ Mcduffie.I also think that If Brian Hartline stays consistent continues to get better in the next. 5 years he has a shot to be mention among st the best. BT: You live in South Florida, do you still follow the Dolphins and if so what your thoughts on team overall? CC: I follow all my former teams. I played with most of Cheifs teammates and San Diego is near to me cause that was greatest and most talented team I ever played on but the Dolphins will always be my team. I like the direction the team is going in. Coach Philbin had a great demeanor and a Franchise quarterback like Tannehill is a great combination for success in this league. BT: Mike Wallace has really struggled to make those timely game changing touchdown catches, whats your take on Wallace so far and how do you think he could improve? CC: Wallace is just starting to find his groove. He has been under thrown many times this year so I expect the timing to improve moving forward. He has never been known as a route runner or going over the middle to make tough catches. If he adds that in him game he would be a tough match for any corner to cover. BT: I mentioned fitness earlier could you provide people more info on Chamber fitness? BT: What exactly made you want to start a fitness center? CC: I did not choose this profession as a second career it kind of chose me. With my platform and desire to be a great role model and mentor, The Chamber Brand has the potential to be special. BT: What would you like Chris Chambers to be most remembered for? CC: I want people to remember that I was a humble guy who gave it his all on Sunday no matter the circumstances and really cares about giving back to the community.